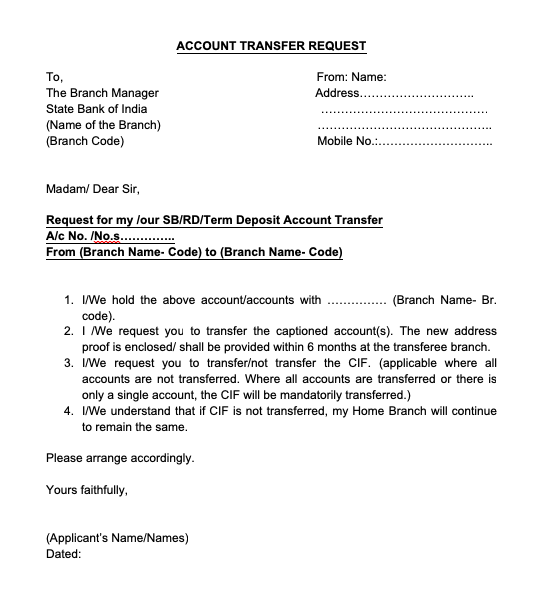 Bank Account Transfer Letter In English are written when an account holder is shifting from one location to another or he is transferring his account. An organization can also make such request in order if they are transferring their accounts. Even there can be any reason for the transferring of bank account to another account. 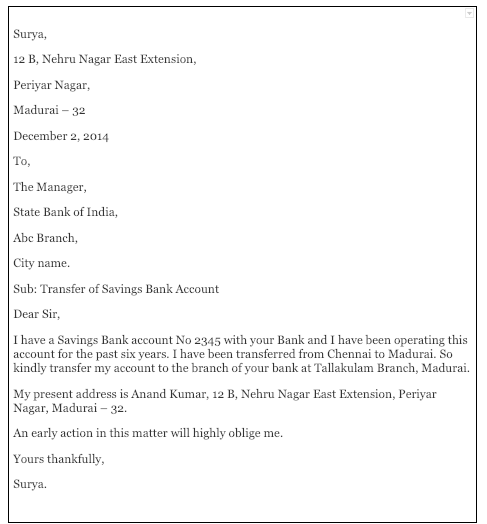 For such issues, one needs to write a well-formatted Bank Account Transfer To Another Branch Letter Format for a better response. These are mostly demanded in account transferring procedure. For these letters, all the stuff related to the bank is required. These need all essential detailing for the transferring. So must own all these and follow the proper format and tips to write an account transfer letter. 1. COLLECT ALL DETAILINGS: although it is a bank related issue and this needs the entire minor to major details to be mentioned. While writing the letter, remember to have an account number, codes, old passbook and chequebook, proper branch name and other account details. 2. REASON FOR TRANSFERRING: the reason that why you are transferring your bank account needs to be mentioned. Although it is not a compulsion to mention this, it will always be better if you are specifying your reason for transferring. 3. BRIEF: your letter should not be elongated up to pages. It should be brief yet informative. Make sure to complete it in a single page. It should be only a requesting letter with bank essentials and required details. 4. ACCURATE: while writing a letter, focus on the accuracy also. Your letter should be free from any kind of error. It should not carry any grammar or spelling mistake. And also focus on bank detailing like account no., codes etc. – Being an official related letter, it should carry a format of the formal letter. – Write it in a professional, skilful and impressive way in order to make it look formal. – Start with the name and address of the sender, then write a date and mention the name and address of the addressee precisely. – Write a subject which will throw light on the reason that why this letter is written and then write salutation. – Write the body of the letter specifying the reason, with details of the bank and making the request for the transferring. – In the end, write your name, give your contact details and signature. Thus we can conclude that the letter of the bank account transfer is an important letter in transferring of account. These include all the bank essentials with all detailing, reason and request for transferring. These letters are important to be written to add up skills and make your work professional. For more details, you can get the samples and examples for the same and format your letter. you can also enclose some copies like leave and license agreement for your shifting.